Finally, share your template. You have two options, you can share your template only with your team or with everyone that’s using the SAP Web IDE. The first option will be the most common one. 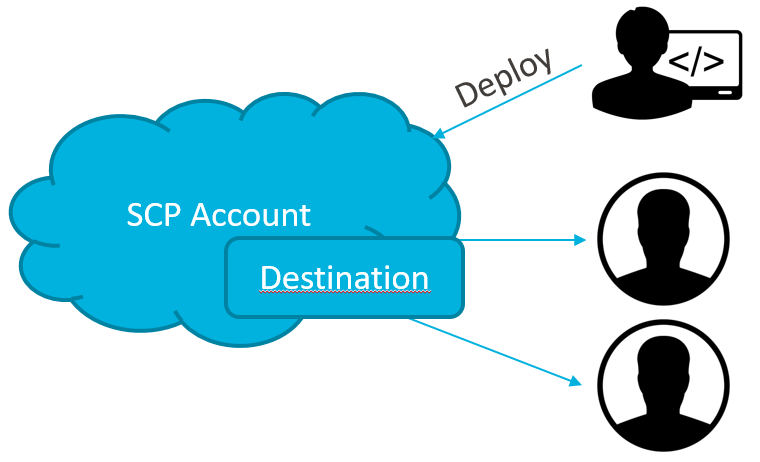 You deploy the template to your SAP Cloud Platform account as an UI5 app and create a destination in the same account to that app. You could also share your template with everyone that’s using the SAP Web IDE. Therefore, you need a special SAP Cloud Platform account. For this kind of SCP account’s, you need to contact the SAP Web IDE team. In this scenario, you need to deploy the template to this special SCP account as a UI5 app. Other developers can create a destination to the template in that SCP account and use it. In my case, I want to use .tmpl files in my generated template (so, after I create a new project, with my own template, I want to use a .tmpl file). But, all .tmpl files are “renamed” so the extention .tmpl is removed from the file. Can I somewhere exclude some files who are not renamed after the generation that you know? But this template also contains .tmpl files. 2 times .tmpl.tmpl didn’t work. Do you know if it’s possible to add a new tab inside the “create project with a template flow” after the “template customization” to have a new screen for customer specific settings? Or did you always put everything in that 1 screen? I am facing the issue with newest version of SAPWebIde. When I am testing template on DEBUG mode it is fine, but I can’t see my template anyway in productive version in plugins (to activate) or in templates. I tried different WebIDEUsage values, but unsuccessfully. Can you help somehow?